Another fall season is rapidly approaching and with it comes the latest edition of the Fear Finder! The digital version will be released this weekend and distribution of hard copies will begin next week, as for now, we can enjoy the beautiful cover art of Steve Shipp. Our unnamed hero is front and center trying to enjoy some fall fare. He seems to have just become aware that a pack of pumpkin reapers are in hot pursuit. Maybe they like cider and donuts too? I love the phosphorescent green that illuminates the shrouds worn by the gourd gang; the shades of orange and red splashed across the scene are equally eye-catching and atmospheric. 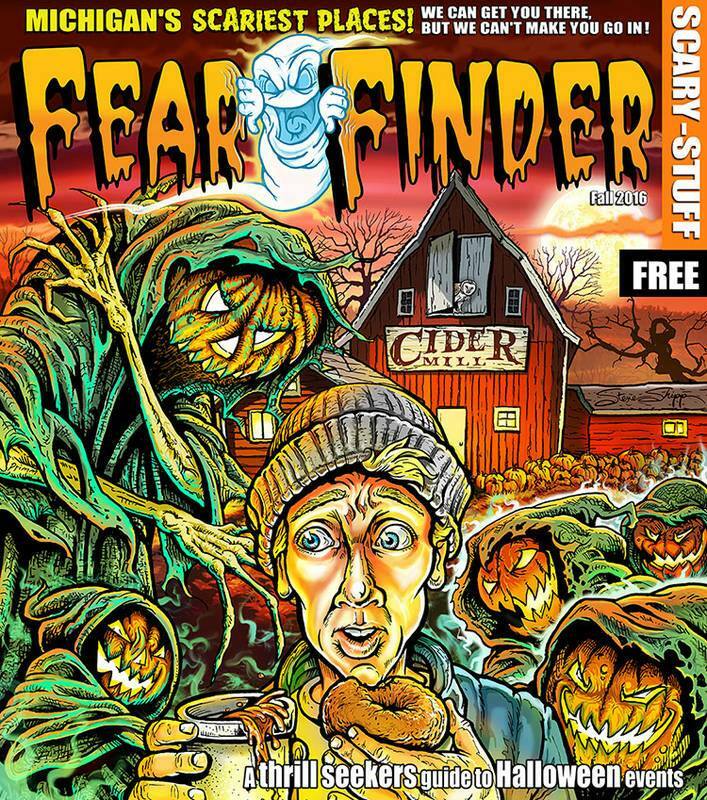 No gimmicks or contrivances here, this is a classic Fear Finder cover by Steve Shipp. In several ways it brings to mind the 2012 cover which was another favorite of mine. I love the autumn allure of this artwork. I am in possession of copies dating back to 2006 and would sorely like to complete my collection. Part of the fun each year with the Fear Finder is cracking open that beautiful front cover and exploring the contents inside to discover new haunted houses as well as which mainstays have disappeared; here’s a brief look at the notable additions and subtractions. Burton’s Haunted Forest – Seemed to be building a reputation for itself; status unknown. The Haunt – Established Grand Rapids attraction probably didn’t see enough visitors from Fear Finder circulation area last year; open for 2015. Junction Valley Railroad Halloween Spook Train – Had advertised with Fear Finder for several years. According to Facebook page the event will continue; open for 2015. Past Tense After Dark – Budding three attraction venue had appeared in the Fear Finder for the last handful of seasons; open for 2015. Salem’s Haunted Village – Open to the public since 2004, will be closed this season. Website states the attraction will reopen next fall. Abandon – Two-story haunted house in Melvindale; will likely check this one out as it is very close to home for me. Bates Haunted Saw Mill – Dual attraction located in the Village of Millington; any connection to the now defunct Night Stalkers? The Dark Box – Situated in Pinckney at Hell Survivor’s, the minimalist approach has me intrigued. The Haunted Elementary – Active on social media, this Bridgeport non-profit may be worth a look with the right planning. Rotten Manor – Located in Holly, website and Facebook page showcase an impressive facade but little else. One of the many welcome signs of the fall season is the release of the Fear Finder cover art. 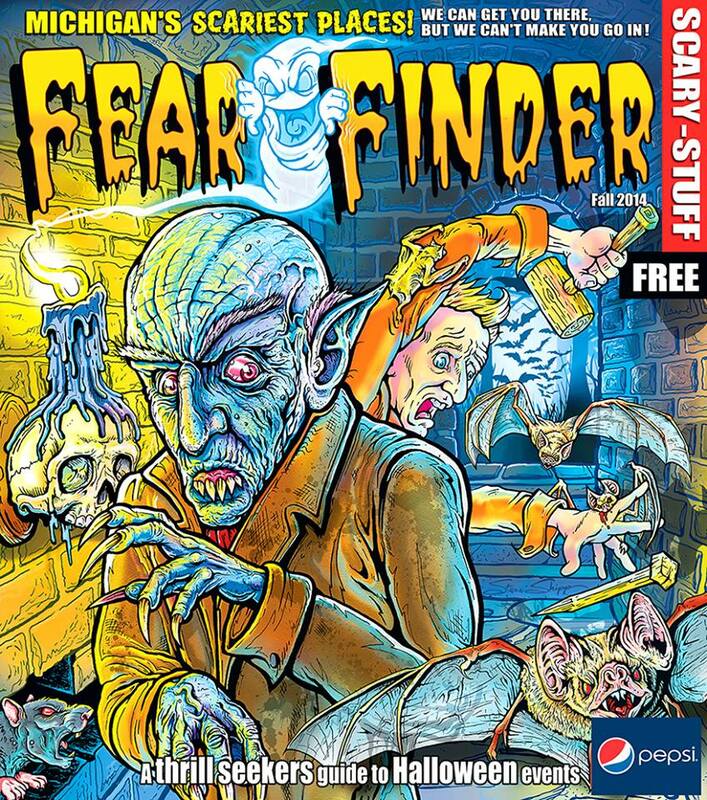 Illustrated by artist Steve Shipp, the artwork has run the gamut of horror troupes during his tenure with the Fear Finder — from a woodland encounter with Bigfoot (2007) to a deranged carnival (2011) to the most recent incarnation which features a secluded graveyard scene, Shipp continues to plumb the depths of all things frightening, eerie and disturbing. The blend of blues/greens with oranges/yellows creates an awesome autumn atmosphere. 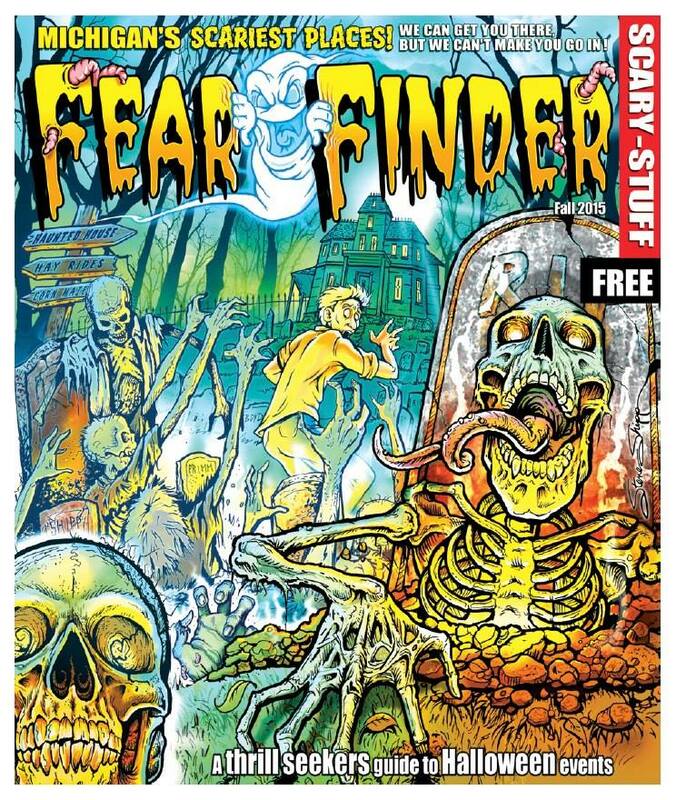 There’s no better prelude to the haunt season than to jump on the Internet to find that the cover of the 2014 Fear Finder has been released; and on the last day of August no less! The release of the Fear Finder is just one of the many fall traditions I enjoy as a Michigan boy. According to several sources the Fear Finder will hit the streets on Friday, September 12 and let there be no doubt that I’ll visit my usual stomping grounds until I’ve obtained a copy. This year’s cover features a Nosferatu-style vampire and he seems to be fleeing a would-be attack through a candle-lit chamber whilst our hapless hero is left to fend off an army of bats. I love the atmosphere created by the artwork and find myself particularly partial to the detailed features on the face and heads of the monster. The 2014 cover is yet another worthy addition in a long line of memorable artwork. The Fear Finder first fascinated me as a child when my brother and I found it at a Taco Bell inside the Southland Mall during the mid-90’s. I can remember thumbing through it as we ate lunch and imagined we would visit so many of the spooky places that beckoned to us from the pages within. I made it a point to collect the Fear Finder while in college but a couple of my copies were discarded during a move in 2005. Currently, I possess at least one copy of every issue since 2006 and am actively trying to track down every issue prior to that dating back to the inception of the paper when it was merely referred to as the Halloween Events Newspaper. On first impression this cover put me in mind of the science lab featured on the 2004 edition of the Fear Finder.